If you don't know who they are, well don't I hate you but I'm not sure I can tolerate you. Just kidding. I can tolerate you. For now. 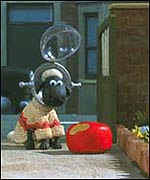 Pictured: Sean the sheep wearing a sweater made of his own fur -- and a space helmet -- for some reason. I haven't seen this episode so I guess I have to hate myself now. Darn it. Back to therapy! *When typing this, I misspelled intellectual. Ha. Ha ha.